Add the herbs in the bottom of the pressure cooker. Place the vegetables on top of the herbs. Almost cover the vegetables with water. When the pressure is up, let it cook for 40 minutes. Turn off then and let it cool to lukewarm, without removing the pressure. Strain the stock from the solids and put it in the fridge. Separate the chicken meat and put that in the fridge or freezer too. The vegetables are no good. Put them in the bin. 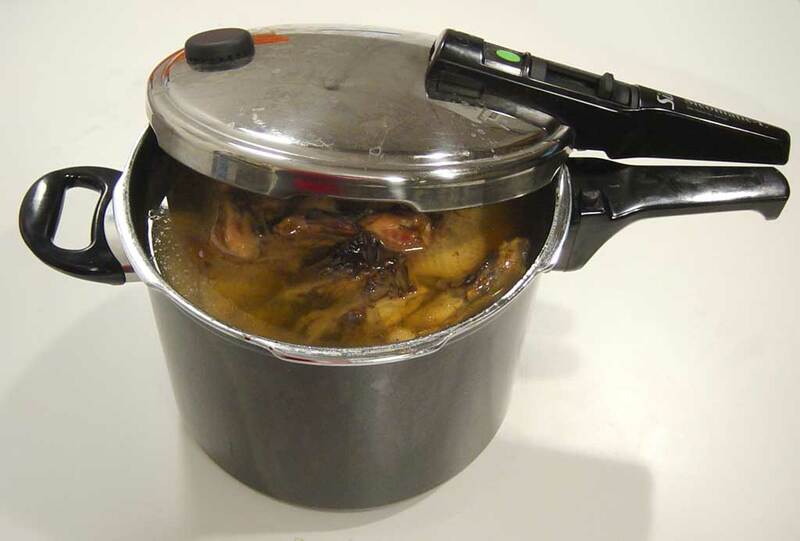 When a pressure cooker is used to boil the chicken, it presses the "chicken juice" out of them. That's why there ends up being a good deal of stock. The pressure cooker is around 120°C (250°F) when it is cooking. But down at the bottom of the cooker there is a little warmer. This means that the so-called Maillard reactions may occur (browning). Therefore, a pressure cooker stock actually gets quite dark without you having to brown the meat or vegetables. Nothing bad happens by letting the stock cool to room temperature in the pressure cooker. Normally we should worry about bacteria. But as long as the pressure cooker has not been opened, it is sterile at the inside. If you want a stronger stock, or just more of it. Then pour the stock back into the pressure cooker and cook an additional 4 kg chicken in the same stock. You can do that 3-4 times more. Each time the stock becomes stronger, and there will be more of it. So you do not need to reduce it like you would do with a normal stock. If possible use veal eat or bones one of the times, if you want some veal stock.